Auto body n paint cheap! 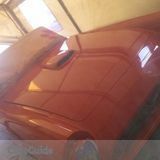 I provide professional auto paint &body work/repair .can match any color from any make & repair heavy damage from coalition or just a spot blend any nicks or dings,I'll restore your automobile to look back to its original state, if your paint is peeling, corroded, just old or if your cat got keys/vandalised i could make out rite .ive painted hundreds of whole cars & car parts (fenders,hoods ,doors trunks, roofs&bumpers) I've painted all kinds of cars from classics to brand new 2015's i also buff out hairline scratches ,or just for shine & i do very nice touch ups when customer does not want to repaint .if you got a bad paint job from someone else I'll make ir rite ! Cracked bumpers or whith a hole mosttimes can be saved & repaired. Quality Painting,Quality service with a smile.